Sucheta was from Kashmir, one of the first friends I made when I moved to Hyderabad. She was a wonderful cook and taught me some of her family's recipes. Every time she went to visit her parents in Kashmir, she would bring back tea leaves and spice powders and give me some of her precious stock. She showed me how to make qahwa - green tea flavoured with spices and almonds. I've made it innumerable times but mine never tasted as good as hers! We would sit at her dining table and between sips of qahwah, she would tell me about life in Kashmir, describe the bitterly cold winters, how the kangri - the portable firepot, kept them warm, and of course, about Kashmiri food. Mutton was the preferred choice of meat, as it was most suitable for the climate. It was from her that I heard about wazwans - the multi course traditional Kashmiri Muslim meal that was usually made for weddings. It's been awhile since I last met Sucheta but I missed her most the day Hyatt Regency Chennai invited me to review their wazwan. Our group included food writers, journalists and bloggers and we were welcomed by Chef Subrata Debnath, Executive Chef at HRC who had curated the food for the festival and Waza Bashir Ahmad. A waza is the chef who has specialised in making a wazwan. The wazwan is the cultural identity of Kashmiri Muslims. Culinary skills are passed down from generation to generation; it is considered an art and only a privileged few can carry this tradition on. Naturally, one becomes a waz only after years of learning from the vasta waza or head chef. The wan is the shop which supplies meats and other delicacies. A traditional wazwan can have up to 36 courses, thank goodness just 10 were being showcased at our lunch. We started the meal with veg seekh kebab and chicken seekh kebab. The kebabs were soft and had a melt in the mouth quality. The chicken kebab was particularly delicious and a little spicy.There was also tabak maaz - twice cooked lamb ribs. Tender ribs had been marinated, boiled in spices and then briefly fried to a beautiful golden colour. While the outside was crunchy, the meat inside was tender. The appetisers were served with a delicious walnut chutney and an onion salad. Mutton rista and gushtaba were served next. The food expert beside me explained that the raw meat has to be at a particular temperature before being hand pounded along with some fat, mixed with spices and then shaped into balls. Rista is cooked in a thin onion tomato gravy and gushtaba in a fenugreek and yoghurt based gravy. He told me to slice it open and when I did, the juices within flowed out. If you have bitten into a rasagulla, you will know exactly what I'm talking about. Both gravies were excellent but my favourite was definitely the gushtaba. We were served tiny sheermal, a leavened bread made of flour and baked. It had been brushed with saffron and was delicious with the gravies. There was also chicken dhaniwal, again in a mild, yoghurt based gravy. Fish in Kashmir is mostly the fresh water variety and we were served a fish korma. This was made of basa, not my fish of choice so I tried only the deep red gravy. Vegetarians will not be disappointed for there's plenty on the menu. 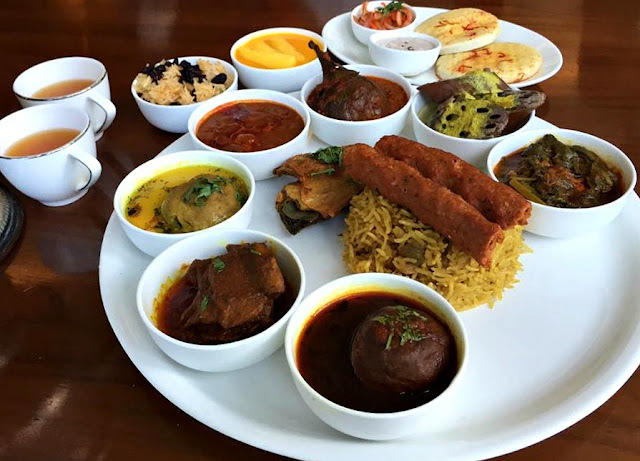 There is nadru yakhni - lotus root cooked in a yoghurt gravy, a vegetable much loved by the Kashmiris, whole eggplant in red gravy, a delicious rajma, cauliflower yakhni and an interesting spinach curry - nadre saag. The gravies were a vibrant red because of the use of Kashmiri chillies, well known for its colour and mild taste. Most Kashmiri gravies are thin in consistency, the juices from the meat form the stock and are perfect when eaten with rice. We were served a delectable Kashmiri pulao, tinged with saffron and with plenty of cashew nuts. For dessert, there was zarda pulao. The rice had the wonderfully nutty texture, it was perfectly sweetened and had a faint taste of orange. It was studded with barberries that lent an interesting taste and texture to the rice. The other dessert was kesari phirni - coarse powdered rice cooked in milk and topped with strands of saffron and mango slices. It too was a beautiful amalgamation of flavour and texture coming together in a dish. Lunch ended with qahwa - Kashmiri green tea flavoured with cardamom and poured from a samovar. What a fitting end to a meal from a place called 'paradise on earth'. This beautiful presentation of the whole meal is called a trami and is priced at 1400/ for non veg, 1100/ for the vegetarian one. The buffet is priced at 1550/++. The Kashmiri Wazwan Festival will be on till June 20th at Spice Haat. For reservations, do call +91 44 6100 1234. *Trami pic courtesy Mohamed Ali M.